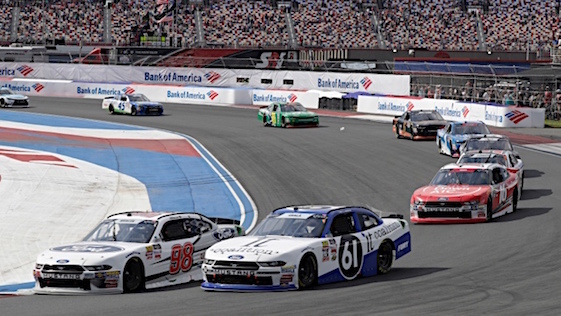 CONCORD, N.C. – For Chase Briscoe and Justin Marks, Saturday’s Drive for the Cure 200 on Charlotte Motor Speedway’s 2.28-mile, 17-turn road course marked milestones in each competitor’s career. Briscoe won his first-ever Xfinity race, finishing 1.478 seconds ahead of Marks. At age 37, it was Marks’ final NASCAR Xfinity race. “I was holding back tears the last couple of laps,” admitted Briscoe, a former Sprint Car driver. “I started praying on the backstretch. I don’t think anyone expected me to win. A Ford development driver, Briscoe has competed in NASCAR Xfinity and truck races this year as well as IMSA events. He won the Eldora Dirt Derby truck race, but his Xfinity season has been lackluster. In fact, prior to the Charlotte race Briscoe’s best finish had been ninth at Chicago and Indianapolis. The 2016 ARCA champion considered it a D- season prior to Saturday’s race. With his victory, he upgraded his season to a C-. Briscoe’s victory came in a Stewart-Haas Racing with Biagi-DenBeste Ford and for the Indiana whose hero was Tony Stewart, that made the victory that much sweeter. While the 23-year-old Briscoe pursues his driving career, Marks sees his future hinging on other business opportunities in the sport. Neither Briscoe nor Marks are in the Xfinity playoffs. Austin Cindric, who finished third, was the highest finishing playoff driver. However, he’s still in jeopardy heading into next weekend’s cutoff race at Dover. Cindric is ninth, nine points behind eighth-place Ross Chastain. The top eight drivers will advance. Christopher Bell, who won the opening playoff race at Richmond, continues to lead the standings with Daniel Hemric second, 33 points in arears. Hemric finished 10th Saturday after failing to complete the frontstretch chicane while in second and closing on Briscoe. That resulted in a stop-and-go penalty that dropped him outside the top five.